Yay! There’s a GUI to execute SSIS packages! Boo! It’s really hard to figure out how to pass variables through it! DTExec: Could not set Package.Variables[User::MyVarA].Value value to Data Source=DevServ1. Not including a forward slash before the variable name. Including quotes around either the variable name or the value. Failing to “fully qualify” the variable name. The lack of detail/instruction on how to use this feature, both in the GUI and online is always surprising to me. 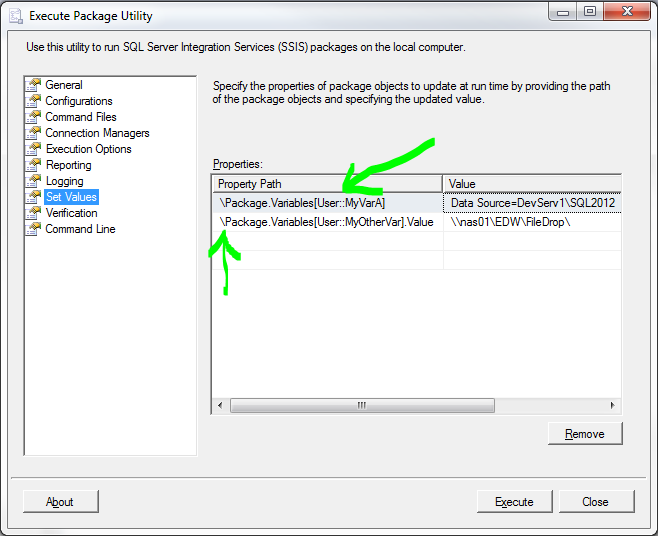 In SSMS (SQL Server Management Studio) object explorer right click on the package you want to run and choose “Run Package”. Select “Set Values” from the menu on the left. Click in the box directly underneath the lable “Property Path”. Enter the value for you variable. You do not need to include any escape characters. They will be handled automatically. I hope you found that helpful! If you were making any other mistakes on getting this to run please leave a comment and let me know and I’ll add it to this post.